On the evening of July 9, 2018 local time, Premier Li Keqiang and Chancellor Angela Merkel of Germany jointly attended the closing ceremony of the 9th China-Germany Economic and Technical Cooperation Forum and delivered speeches at the Federal Ministry for Economic Affairs and Energy in Berlin. Li Keqiang expressed that China-Germany cooperation has maintained a comprehensive, stable and healthy development momentum and has long led China-European Union (EU) cooperation. Serving as a model of cooperation between major countries, China-Germany cooperation has injected impetus into the economic development of the two countries and the world at large. President Xi Jinping paid a successful visit to Germany last year and jointly planned the development of China-Germany relations with German leaders. I co-chaired the fifth round of China-Germany inter-governmental consultation with Chancellor Angela Merkel today and reached important consensus. We both agreed to continue to consolidate and improve political mutual trust, consolidate the foundation of China-Germany all-round strategic partnership, promote China-Germany cooperation to march towards higher levels, and add stability to world peace and development with the certainty of China-Germany cooperation and the consistency of safeguarding multilateralism. Li Keqiang pointed out that we should deeply tap into potential for trade, further improve the level of trade facilitation, and expand service trade. German enterprises can make great accomplishments in expanding their exports of superior goods, high-end equipment and high-quality services to China. Both sides should expand two-way investment and provide a fair, transparent and predictable investment environment for Chinese and German enterprises to invest in each other's country. Both countries should actively promote cooperation in innovation, strengthen the alignment of innovative development strategies, give full play to the roles of cooperation platforms including electric vehicles and intelligent manufacturing, and enhance cooperation in emerging industry areas such as artificial intelligence, new energy vehicles and autopilot. The two countries should expand trilateral market cooperation, guide enterprises of both countries to carry out trilateral market cooperation in such areas as connectivity, industrial construction, equipment manufacturing, energy conservation and environment protection as well as rail transit, and discuss the first experiment and practice in Central and Eastern Europe, Latin America, Africa and other regions. 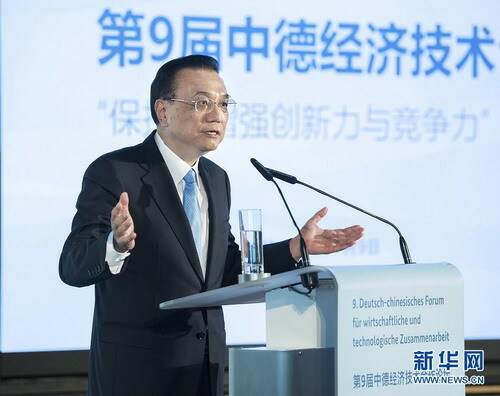 Li Keqiang emphasized that China-Germany economic and technical cooperation is inseparable from a free and open trade and investment environment. Both sides reiterated that they will jointly safeguard free trade, firmly oppose unilateralism and protectionism, and safeguard the rules-based multilateral trading system. In today's economic globalization, keeping a narrow focus on the outdated mentality of "zero-sum game" and willingly provoking trade disputes will not only harm the interests of the two parties concerned, but also hurt the interests of all parties in the global industrial chain, without any winner. Li Keqiang expressed that the current sound momentum of China's economic development is the result of constant optimization of its economic structure and enhanced endogenous development impetus in recent years, and it has fairly strong stability and sustainability. China has the confidence and the ability to cope with various risks and challenges. China will offset unilateralism and protectionism by continuing to actively expand opening up, expand diversified markets with fair, open and transparent competition, and enhance endogenous impetus and maintain the momentum of sustained, stable and sound economic growth by managing its own affairs well. Angela Merkel noted that Germany-China cooperation has continuously achieved new outcomes in recent years, with artificial intelligence and electric vehicles becoming new areas of cooperation between the two countries. Today, both sides signed many high-level cooperation agreements, including autopilot, which will effectively advance bilateral cooperation. China's investment in Germany has entered a new stage. Germany holds an open attitude towards it and welcomes Chinese enterprises to increase investment in Germany. The German side appreciates China's positive measures of improving market environment and opening up the financial industry. China is a big market with a population of more than 1.3 billion. Germany-China cooperation enjoys great potential and broad prospects. The German side expects the upcoming EU-China Summit to achieve positive outcomes, push forward the negotiations on EU-China investment agreement for new progress, and prevent the world from falling into the cycle of trade protectionism. Trade wars impact all countries and harm the interests of all countries. Germany stands ready to, together with China, send out the voice of jointly supporting free trade and opposing trade protectionism. More than 400 representatives from the Chinese and German economic circles attended the forum. Xiao Jie and He Lifeng attended the above activities.